Heather Lang: Thank you, Fiona Sze-Lorrain, for taking time out of your brimming schedule to chat with me about your art. 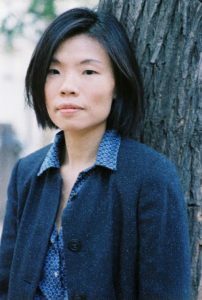 As you know, I greatly admire your latest poetry collection, The Ruined Elegance (Princeton University Press, 2016), and am enamored with your translation of Sea Summit (Milkweed Editions, 2016) by Yi Lu, both of which I’ve had the pleasure of reviewing for TLR. I’ve also spent many a commute listening to your album Une seule prise (In One Take). I’m thrilled to be chatting with you about your literary art and your music. Because you’re a master of so many endeavors, it’s difficult to know where to start. That said, I’m interested in how you found poetry. I’m also interested in your process. Moreover, in my review of your collection, I mentioned that “The Ruined Elegance also pulls back the curtain that separates the public and the private.” I’d love to know if this is something you’ve worked to do consciously, if you agree with my readings, etc. Perhaps selfishly, I’d love to know if anything I wrote about your work in my reviews struck you as something you didn’t expect a reader (in this case me) to see/experience. poems subtract in order to add, so your metaphor of “a curtain” is meaningful to me. I am unsure if I have understood “pulls back” the same way as you have observed, but yes, there is a separation between the public and the private in my work—I am also interested in looking for moments from a zone that is either both or that exists somewhere in-between. As a reader, I don’t usually go for the confessional (or the first degree), if the writing merely fleshes out the memory of an experience so as to make it right on paper. And I think therapeutic effects of writing can be limited when this focus on “self” is a sustained project. Of course what you wrote about my work in your reviews, as is/was the case for other reviews and reviewers, has offered me something I might not have expected at the time of writing or translating—thank you very much. I enjoy reading constructive reviews in that they teach me something about the reciprocal other, even if I might not agree with them on all grounds. I avoid reviews written by reviewers who try to come across as smarter than the authors or need to assert their authority (to make known their presence) in order to judge and possess their interpretation. Judge and be judged. I think it is very much in one’s sincerity—and hopes for the work/author—as well as the tone of the criticism. Being critical and difficult is the easy thing. To work with criticism and difficulties is not. HL: I’d like to ask you about your translation work. It was my first encounter with your art, and Yi Lu’s Sea Summit is only one of your translations that I’ve come back to again and again. I Can Almost See the Clouds of Dust by Yu Xiang, Canyon in the Body by Lan Lan, and Taiwanese poet Ling Yu’s A Tree Planted in Summer are on my most immediate bookshelf, as well. Could you please tell us a bit about how you started your journey as a literary translator? FSL: I started translating in 2002/03. That’s about fourteen years ago. I worked on a range of translations, both literary and commercial, before focusing on literary translations, and specifically poetry. I translate from French or Chinese to English, and from English to French. In the past, I had also translated plays—not much, but they were all very invigorating projects that taught me to undo a line in another tongue so that it could come alive in the theatrical time-space and be heard fresh. My choice of poetry has to do with the fact that I write poetry and believe in its longevity: I think of it as a possibility for me to offer poetry what poetry has offered me. It is also a different way of making music. HL: Could you please speak to us a bit about your translation process? If your approach varies from project to project, why? I’d love to hear about any challenges you’ve encountered and brilliantly overcome, as well. HL: I was unsurprised when I learned that you are a musician, a master harpist. As a graduate student. I spent a good chunk of time exploring poets who have mastered both the art of the image and a superb attention to sound. More specifically, I dove into the ways in which Fiona Sampson, a former career violinist, not only writes poetry about music, but also incorporates white space in a way that creates a musicality, such as tempo changes and fermatas, I feel. I see similarities between your poetry and hers in that regard. For example, your poetry demonstrates a mastery in stanza breaks and enjambment. In “Granted Asylum,” for example, you write, “The buried book showed its teeth. // Under dust, but finished / with silence.” In only three short lines, you’ve created suspense through the one-line stanza. Moreover, there seems to be a crescendo of sorts in the second line, “Under dust, but finished,” before the decrescendo of “with silence.” This effect seems possible due to the complexities of the word “finished,” which imply both a literal death and an aesthetic detailing, paired with the superb enjambment. Could you please talk a bit about the ways in which your musical training has informed your poetry? FSL: I must confess that I get this question often. My musician colleagues are equally curious about my work in poetry and translation, though they seem to seek less of a cognitive response on my part. Being a working musician, I learn to “see” words as musical notes, so the idea of a verse or stanza in poetry is very much akin to a phrase or passage of music. Even in fast passages, it is very much about working through the notes—in particular, their transition—so slowly that one can hear not just the music, but the non-music as well. I hear cadences in poetry, in that a line break may to my ear sound like a plagal cadence (IV–I) or an interrupted cadence (V–VI), for instance. Elsewhere I’ve mentioned, too, that in poetry I read the character of music, and vice versa. These days, I listen to Baroque music, Schubert, Schumann (both Clara and Robert), Brahms, Saint-Saëns, Poulenc, canzone napoletana, Aretha Franklin, and as part of my daily zheng music diet, more recent renditions of the Zhejiang repertoire. I also like to sight-read scores and enjoy working on figured harmony exercises. It took me a while to realize that my music education was—and is—my “yoga.” It keeps me contented and hopeful for poetry and life. It, too, keeps me on my toes when I write: to say something with the most of music, and the least of rhetoric. I sense that you might have expected a much more enlightening or profound answer. I hope this doesn’t disappoint. HL: I know that you’re currently focusing on guzheng concerts, exploring poetry and texts in ancient harp music, and translating Mark Strand’s writing from English to French, among other endeavors. What can you tell us about those projects and how they inform one another? FSL: I am working closely with another harpist based in Europe for a zheng duo. Our repertory contains new contemporary zheng compositions. By “new,” I mean compositions from year 2010 and onward. We get to experiment with modern fingerings so to speak, and perhaps some rarely tried techniques. I am also arranging or rescoring both classical and new zheng music. It is very much like “translation” in spirit, except that it isn’t in words. HL: Fiona, may I ask you what you’re reading right now, for pleasure or othewise? FSL: I read the press. I am reading Paul Celan’s The Meridian: Final Version—Drafts—Materials and Robert Bresson’s Notes on the Cinematograph (Notes sur le cinématographe). This past summer I read parts of Amartya Sen’s The Idea of Justice. I am also reading some phytotherapy materials and fashion magazines. I have an obsession with recipes. One of my recent foci is gluten-free pastry. HL: As a World Literature Editor with TLR, I’ve been asked how emerging literary translators might get their feet wet. More specifically, do you have any advice for new translators who are hoping to connect with and translate current work? FSL: I wish I had some magical pill that I could mass-produce and share with other literary translators, but I don’t. Translation is sometimes a myth. For most part of it, it should be low key, rather than inviting attention to its “processes,” because the work can speak for itself. Imagine a theatrical director or actor who consistently, or methodologically, shares with the spectators what has/had happened during rehearsals or backstage, before and after the show. I do think that one should translate because one truly connects to the work. Whenever I need a boost of morale, I revisit Beckett’s translation of Apollinaire. HL: Fiona, for our readers who aren’t yet familiar with your stunning work, where might they find some online? More specifically, might you be able to direct us to one poem, one translation, and one song? FSL: “Not Meant as Poems” from Poetry Northwest. One of the two translations of Ye Lijun, also in Poetry Northwest. Or “Trace,” the title poem from a new bilingual handmade chapbook of Yu Xiang whose earlier collection (I Can Almost See the Clouds of Dust) you have previously mentioned. Any song from In One Take (Une seule prise). HL: Thank you, Fiona Sze-Lorrain, for chatting with me about your important work. I look forward to reading more poems and hearing more music. Thank you for inspiring me. Heather Lang is World Literature Editor of The Literary Review. You can learn more about The Ruined Elegance by reading our review.